AUTO MANUFACTURING JOBS: Trump’s steel tariff would cause losses in the US of 18,000 to 40,000 by the end of 2019. An average car contains 1.2 tons of steel. The steel tariff will increase the price of cars manufactured in the US between 0.5 and 0.8 percent. Price rises of US -made cars would translate into a 1.6 and 3.6 percent drop in global sales. Is Navarro right? To answer, we’ve analyzed historical data to estimate the impact of Trump’s proposed 25 percent steel tariffs on auto sales and employment. We estimate that an average car requires roughly 1.2 tons of steel to build. Given that tariffs tend to increase import prices (which determine domestic prices) by at least as much as the tariff, we calculate that a 25-percent steel tariff will increase the price of new passenger vehicles manufactured in the United States between 0.5 and 0.8 percent. Now, based on calculations for the sensitivity of auto sales to price, we estimate that such price rises of American-made cars would translate into a decline of between 1.6 and 3.6 percent in global sales. But what does this mean for American auto jobs? 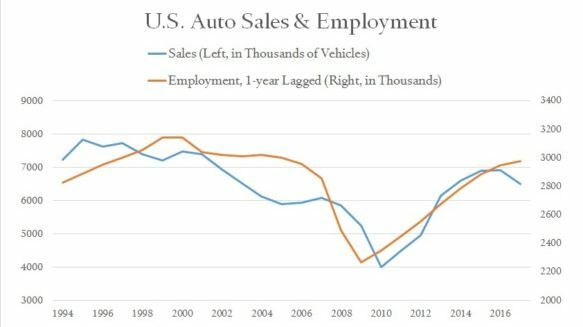 The historical relationship between US auto sales and employment is tight, as shown below. Based on this relationship, we would expect declining sales to result in auto-industry job losses ranging from 18,000 to 40,000 by the end of 2019. Given that employment in the US auto industry is vastly higher than in the US steel industry, such job losses would swamp any possible increase in steel employment. the total amount of jobs at risk from Trump’s steel tariffs in the US auto industry alone is equivalent to almost one-third of the entire US steel industry workforce. In short, Navarro is wrong—deeply so. Employment in the US auto industry will suffer from Trump’s tariffs to a vastly greater degree than it could possibly benefit in the US steel industry.